A four-drum delayed coking unit. Each of the two derricks above the drums contains two drill stems. The large white pipes in the foreground are the flue gas stacks from the feedstock cracking furnaces. 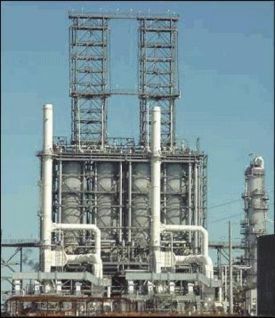 Delayed coking is one of the chemical engineering unit processes used in many petroleum refineries. The main objective of the delayed coking unit is to convert low value residual products to lighter products of higher value and to produce a coke product. In brief, the process heats the residual oil from the vacuum distillation unit in a petroleum refinery to its thermal cracking temperature in the heat transfer tubes of a furnace. This partially vaporizes the residual oil and initiates cracking of the long chain hydrocarbon molecules of the residual oil into hydrocarbon gases, coker naphtha, coker gas oil and petroleum coke. The heater effluent discharges into very large vertical vessels (called "coke drums") where the cracking reactions continue to completion, forming solid petroleum coke which deposits out and accumulates in the coke drums from which the product coke is subsequently removed. The adjacent photograph depicts a delayed coking unit with 4 coke drums (two pairs of two drums). However, larger units may have as many as 8 drums (four pairs of two drums), each of which may have diameters of up to 10 meters and overall heights of up to 43 meters. The yield of coke from the delayed coking process ranges from about 18 to 30 percent by weight of the feedstock residual oil, depending the composition of the feedstock and the operating variables. Many refineries world-wide produce as much as 2,000 to 3,000 tons per day of petroleum coke and some produce even more. Globally, the total amount petroleum coke produced in 2010 was about 123,000,000 metric tons (123 Mt) and is expected to increase at an annual rate of about 5.6 percent. Petroleum coke may also be produced in an oil refinery unit process that utilizes fluidized bed technology. However, there are very few such facilities in operation and the amount of petroleum coke produced via such technology is virtually insignificant. Another type of coke, commonly referred to as "metallurgical coke", is the solid carbonaceous material derived from the destructive distillation of low-ash, low-sulfur bituminous coal. Volatile constituents of the coal are driven off by baking in an airless oven at temperatures as high as about 1,200 degrees Celsius (about 2,200 degrees Fahrenheit). Metallurgical coke is used as fuel and as a reducing agent in the iron and steel manufacturing industries. The worldwide consumption of metallurgical coke was about 450,000,000 metric tons (450 Mt) in 2010. 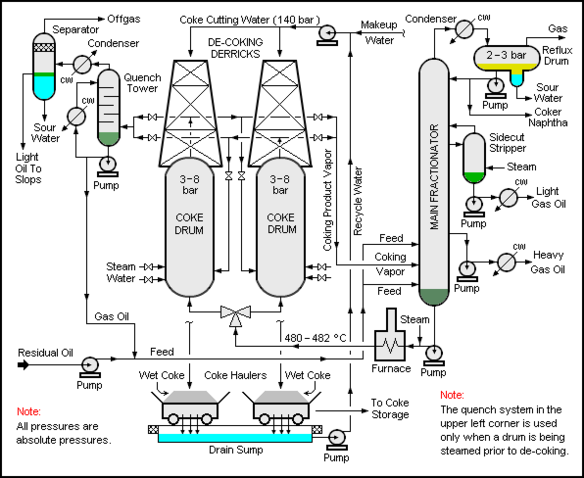 The flow diagram and description in this section are based on a typical delayed coking unit with two coke drums. However, as mentioned above, larger units may have as many as 4 pairs of drums (8 drums in total) as well as a furnace for each pair of coke drums. Residual oil from the vacuum distillation unit (sometimes including high-boiling oils from other sources within the refinery) is pumped into the bottom of the distillation column called the main fractionator. From there it is pumped, along with some injected steam, into the fuel-fired furnace and heated to its thermal cracking temperature of about 480 °C. Thermal cracking begins in the pipe between the furnace and the coke drums, and finishes in the coke drum that is on-stream. The injected steam helps to minimize the deposition of coke within the furnace tubes. Pumping the incoming residual oil into the bottom of the main fractionator, rather than directly into the furnace, preheats the residual oil by having it contact the hot vapors in the bottom of the fractionator. At the same time, some of the hot vapors condense into a high-boiling liquid which recycles back into the furnace along with the hot residual oil. As cracking takes place in the drum, gas oil and lighter components are generated as a vapor phase and separate from the liquid and solids. The drum effluent is vapor (except for any liquid or solids entrainment), and is directed to main fractionator where it is separated into the desired boiling point fractions. The solid coke, formed in the on-stream coke drum as the cracking reactions continue to completion, is deposited and remains in the coke drum in a porous structure that allows flow through the pores. Depending upon the overall coke drum cycle being used, a coke drum may fill in 16 to 24 hours. After the drum is full of the solidified coke, the hot mixture from the furnace is switched to the second drum. While the second drum is filling, the full drum is steamed out to reduce the hydrocarbon content of the petroleum coke, and then quenched with water to cool it. The top and bottom heads of the full coke drum are removed, and the solid petroleum coke is then cut from the coke drum with a high pressure water nozzle, where it falls into a pit, pad, or sluiceway for reclamation to storage. The table below lists the specifications for raw petroleum coke produced in a delayed coker and the corresponding specification after the raw coke has been calcined in a rotary kiln at 1200 to 1400 °C. The raw coke is classified as sponge coke and often referred to as green coke. The product coke from a delayed coker has many commercial uses and applications. The largest use is as a fuel. Petroleum coke was first made in the 1860's in the early oil refineries in Pennsylvania which boiled oil in small, iron distillation stills to recover kerosene, a much needed lamp oil. The stills were heated by wood or coal fires built underneath them, which over-heated and coked the oil near the bottom. After the distillation was completed, the still was allowed to cool and workmen could then dig out the coke and tar. In 1913, William Merriam Burton, working as a chemist for the Standard Oil of Indiana refinery at Whiting, Indiana, was granted a patent for the Burton thermal cracking process that he had developed. He was later to become the president of Standard Oil of Indiana before he retired. In 1929, based on the Burton thermal cracking process, Standard Oil of Indiana built the first delayed coker. It required very arduous manual decoking. In the late 1930's, Shell oil developed hydraulic decoking using high-pressure water at their refinery in Wood River, Illinois. That made it possible, by having two coke drums, for delayed decoking to become a semi-continuous process. From 1955 onwards, the growth in the use of delayed coking increased. As of 2002, there were 133 petroleum refineries worldwide producing 172,000 tons per day of petroleum coke. Included in those worldwide data, about 59 coking units were operating in the United States and producing 114,000 tons per day of coke. There are other petroleum refining processes for producing petroleum coke, namely the Fluid Coking and Flexicoking processes both of which were developed and are licensed by Exxon Mobil Research and Engineering. The first commercial unit went into operation in 1955. However, neither of those two process achieved widespread, global usage. There are other similar coking processes, but they do not produce petroleum coke. For example, the Lurgi-VZK Flash Coker which produces coke by the pyrolysis of biomass. Another form of coke, commonly referred to as metallurgical coke, is a solid carbonaceous residue derived from low-ash, low-sulfur bituminous coal from which the volatile constituents have been driven off by baking in an oven without oxygen at temperatures as high as 1,200 °C (2,192 °F). ↑ Leffler, W.L. (1985). Petroleum refining for the nontechnical person, 2nd Edition. PennWell Books. ISBN 0-87814-280-0. ↑ Staff (November 2002). "2002 Refining Processes". Hydrocarbon Processing: pp. 85-147. ISSN 0887-0284. ↑ Petroleum Coke Industry to 2015 - Strong Demand Growth Driven by Increased Focus. From a report developed and published by Global Data, Ltd. of London, England. ↑ Hydrocarbon Processing staff (November 1998), "Hydrocarbon Processing's Refining Processes '98", Hydrocarbon Processing, pp.62-64. ↑ Eurocoke Summit 2011 – Vienna. From the website of the Steel Times International journal. ↑ J.M. Lee et al (1997). Quality analysis of petroleum cokes and coals for export specifications required in use of specialty products and utility fuels., 214th National Meeting, American Chemical Society , Volume 42(3):844-853. ↑ 17.0 17.1 Staff (December 31, 2002). "2002 Worldwide Refining Survey". Oil and Gas Journal: pp. 68-111. ISSN 0030-1388. ↑ John C. McKetta (Editor) (1994). Encyclopedia of Chemical Processing and Design (Volume 48). CRC. ISBN 0-8247-2498-4. ↑ Jean-Francois Le Page, Sami Chatila and Michael Davidson (1992). Resid and Heavy Oil Processing. Editions Technip. ISBN 2-7108-0621-5. This page was last modified 06:46, 11 September 2013.